Today we have a special treat for you . It is release day for book 3 in the LAST BUCELARII series . 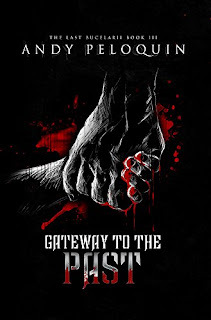 GATE WAY TO THE PAST by Andy Peloquin. The Hunter, legendary assassin of Voramis, has a purpose: protect Hailen, the boy he rescued from a demon in Malandria. He joins a caravan in the hope of safe passage across the Advanat Desert. Yet he cannot outrun his enemies: the Illusionist Cleric on a holy mission to capture him, the bloodthirsty raiders out for blood and gold, and the Abiarazi, demons who masquerade as humans. Every step north reveals who he was before becoming the Hunter, unlocking the truth about the woman who haunts his memories. I was so excited when this showed up on my kindle to read . I love this series so much . The first book pulled me in and the second book had me hooked . This book just kept me on the edge of me seat. This book dives deeper into the Hunter and what is fueling him as he tries to out run some demons and getting closer to the secrets of his past . When we meet the Hunter again he and his young charge Hailen is heading away from the city. They join a caravan where things get pretty bad and the Hunter is forced to use his dagger to protect the young child , who actually calms the demon inside the hunter . When the hunter is forced to kill to keep the child safe, and to find the answers he needs. I must say that Hailen is the perfect companion for the Hunter . He has such a good calming influence on the Hunter . Hailen is your typical little boy with such a special gift . You just want to cuddle him and hug him and love him . He has his good moments and his typical boy moments of wanting and whining. Buy what child doesn't have those moments . The hunter in this book is becoming more and more human . He still has his half demon side that wants the blood of the evil . But the human side of him is starting to get his memories back and wants to find out what he was before becoming the Bucelarii . As he remembers the memories , you want to hug him and tell him that things will be ok. You also feel him start to think about his actions and how they work. He is growing and becoming more then just the killing machine he was in book one and two .